After applying for the Rajasthan Police Constable Recruitment 2017, contenders are asking for the Rajasthan Police Constable Syllabus 2017 because this recruitment is a golden opportunity for them and they want to grab this chance. This is possible only when they get success in the round of the selection process. For the written examination, aspirants need to prepare according to the decided syllabus and examination pattern. Candidates can check the proper syllabus and exam pattern by scrolling download their page. 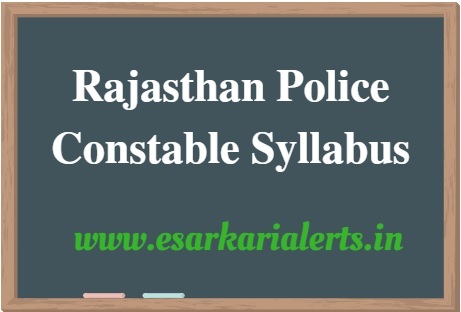 Facts of this Page: Rajasthan Constable Syllabus 2017-18, Rajasthan Police Constable Exam Syllabus, Rajasthan Constable Exam Pattern 2017 and Rajasthan Constable Exam Preparation Tips. About Rajasthan Police Constable Exam: The Rajasthan Police Department is conducting this examination for the purpose of recruitment of eligible candidates on 5500 vacancies of the constable in the department. A large number of aspirants have submitted their forms for this job advertisement. After the completion of online registrations, the organization will give a written examination. This exam will be a part of the selection process for these vacancies. The exam will be a computer-based test. Questions in this test will be of objective type. The written examination will be of total 75 marks. There will be three parts of this test Part ‘A’, Part ‘B’ and Part ‘C’. There is also the provision of the negative marking of ¼ Mark. In order, to crack this government job exam, candidates are advised to start their preparation according to the above-mentioned examination pattern. Collect the proper books of these subjects and start reading these books. After completing the entire syllabus, start solving model papers and read question banks. While your preparation, given importance to all subjects because time management plays an important role in success in any work. Here is the complete guide to crack government job exams.